Improved posture takes practice, and this lumbar support backboard will help you sit up straighter. The Makers teamed up with The London Spine Clinic to create tools that would adapt to your daily life, reduce posture-related pain, and prevent back slumping. Dimensions: 1.4" x 10" x 21.2"
First pad I have found that fits in my car seat. Great for helping you sit straight at computer! Wow! I'm impressed!! This little board really helps you sit straight at a computer or for that matter what ever you do, sitting! 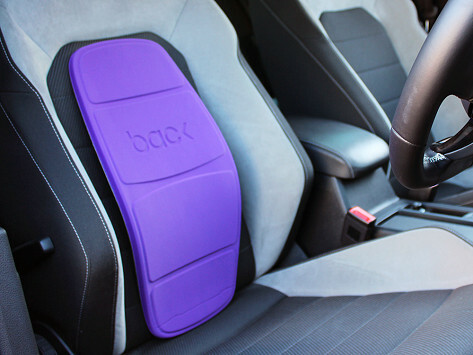 From slumped to straight—this back support shoulder brace, backboard, and cushion can improve your posture at work, in the car, or at home. So you don’t have to reinvent your routine to realign your back. The Makers behind this Grommet know that good posture takes practice. They teamed up with the London Spine Clinic to create tools that target key muscle groups at play in sitting up straighter. Use the backboard for lumbar support wherever you sit to help restore the inward curve of your spine. It’s comfy, so you’ll also feel more motivated to sit straight and correct bad habits. 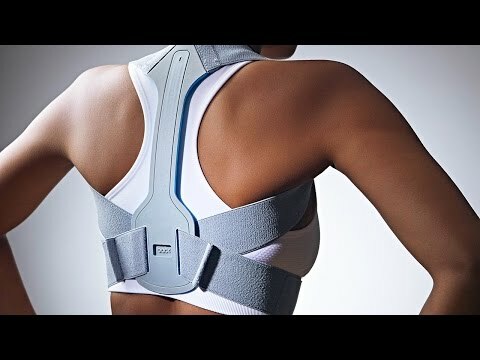 Wear the brace like a backpack for a couple of hours each day and you’ll start noticing the shift in your spine. And the cushion helps strengthen your core—and keeps you from slouching—simply by sitting on it. You don’t need to go out of your way much to improve your posture. The alignment tools from Back Pain Help adapt easily to your day-to-day.